I believe that's probably what it does, though I'm unsure if the story will reflect the changes in its text. Also, I might have to fix a potential bug with the Tutorial's Folders when using Chip Code Roulette Mode 3, the Pseudo Random one. That one is the least-tested and I just realized the tutorial requires two chips to have the same code, so I might have to add some extra code just so the Tutorial folder is functional. EDIT: The Tutorial Folders are still functional, I actually left their Chip Codes untouched by the Roulette Modes. EDIT 2: The All Star mode had a bug where it would not make every letter of every chip the Asterisk symbol. This has been addressed and I've updated the files. Also, I've found out that the Chip Traders and Blue/Purple Mystery Data are not changed at all within the randomizer itself, and I have no idea where to start looking for their offsets. If anything, I'd rather leave them alone for now though, as you basically get every chip just by playing the game anyway. Expect to have some abnormal codes if you're playing any of the new Chip Code Roulette Modes though. This was due to the All Star mode bug mentioned above. NOW it's fixed. EDIT 3: The Chips the game requires you to have are read correctly in the other modes, even though their codes are different. I tested it live on stream using All Star mode, so it should work with the other modes just as well. Just updated the randomizer again today, with a rather interesting feature: Chip Code Roulette Modes. Basically, there's a value you can type in now, ranging from 0 to 3, that will change how the game generates Battle Chip Codes, including those found in folders in the game. This includes the Tutorial Folders as well! The 4 different modes are as followed: Mode 0 is Normal Chip Codes mode. The game's built-in codes will be used. Mode 1 is All Stars mode. The game will turn every chip into a * Chip (the Asterisk symbol)! This also means some PAs will break, but it's a trade-off that's worth experimenting with. Mode 2 is Simplified Chip Codes mode. The game will only use ABCDE* for every chip. All Folders in the game will generate with all A chips for easier play. Mode 3 is Pseudo Random Chip Codes Mode. All chips are generated with 5 random codes (split into categories of 5 letters each) and *. NONE OF THIS HAS BEEN TESTED FOR STORY PROGRESSION. You have been warned. The game requires 4 chips from the player (LongSword E, wind *, Yoyo L?, IceBall M), and although the randomizer gives them to you on Mode 0, I can't say for sure if the other modes will give you the correct chips. Please let me know if these work, and I'll do my own seperate testing on the side. After thorough testing of that bitflag (due to various accidental mistakes I made), I can safely say that it is indeed the Element bitflag. This means Viruses and Navis can only have 4k HP maximum. I left the possibility to multiply it higher in anyway in case it works out somehow, though it'll only attempt to work on Navis without any element. The hardcap of HP for everything is now 4,000 HP (Element-less Navis at 9,000, though this might result in weird circumstances). Chip and P.A. Damage still have no maximum, though I might program one in if push comes to shove. Besides that, you should be good to go use this for everything except races, as the seed is chosen automatically. I MIGHT fix this, but no guarentees. EDIT: Added a Seed input box, and it now saves the seed to a new text file for you whether your type one in or not. Feel free to have fun with races now! Just make sure to share modifiers between your racing rivals. I fixed the Jelly crash! It was caused by me changing the Jelly virus' HP values. Strangely enough, there's a bitflag in their HP value that determines something I'm unaware of. I added a hardcoded check to prevent further issues. 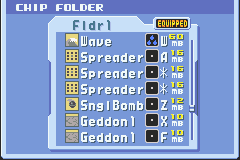 EDIT: This bitflag was on a lot of enemies, including 4 of the boss Navis. This leads me to believe that it might be the enemy Element flag, which also means that enemies can realistically only hold 4000 HP. I set it up to allow up to 9000 as a hard cap for HP and 4000 for enemies that have this bitflag, however, so that should mitigate most of the problems that have been occuring. It's already been updated, so go ahead and play around with it to your liking.